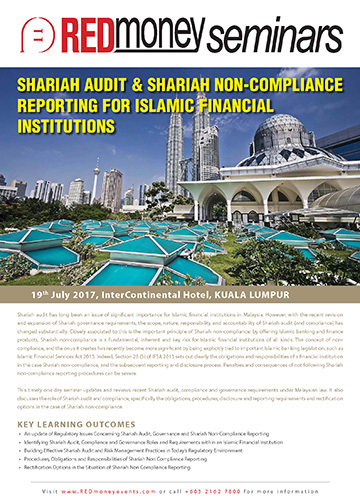 Shariah audit has long been an issue of significant importance for Islamic financial institutions in Malaysia. However, with the recent revision and expansion of Shariah governance requirements, the scope, nature, responsibility and accountability of Shariah audit (and compliance) has changed substantially. Closely associated to this is the important principle of Shariah non-compliance: by offering Islamic banking and finance products, Shariah non-compliance is a fundamental, inherent and key risk for Islamic financial institutions of all kinds. The concept of non-compliance, and the onus it creates has recently become more significant by being explicitly tied to important Islamic banking legislation, such as Islamic Financial Services Act 2013. Indeed, Section 28 (3) of IFSA 2013 sets out clearly the obligations and responsibilities of a financial institution in the case Shariah non-compliance, and the subsequent reporting and disclosure process. Penalties and consequences of not following Shariah non-compliance reporting procedures can be severe. This timely one day seminar updates and reviews recent Shariah audit, compliance and governance requirements under Malaysian law. It also discusses the role of Shariah audit and compliance, specifically the obligations, procedures, disclosure and reporting requirements and rectification options in the case of Shariah non-compliance.